Matt, Chris, and Grant are joined by Caroline Troein from the Fletcher School’s Neptune Group. They talk about the Arctic, the European Defense burden, Typhoon Haiyan, China, the Hudson Center’s American Seapower event, as well as a smattering of other topics. Join us for Arctic Wastes and Tropical Shoals (Download). Sea Control comes out every Monday and is available on Itunes, Xbox Music, and Stitcher Stream Radio. Join us! This week, we talk about our military’s Strategic Goals, Strategic Planning, and Strategic Communication; Tim Walton, Delex consultant and Annie George, CIMSEC President, join us for Episode 2- Strategy (download). If you remember from my previous post I suggested that a fleet consisting of 13 frigates, 3 CVL, 5-6 tankers, and 4 RFA-operated assault ships struggles to provide a continuous offensive presence because we have to off-deck many of the required ASW helicopters onto the assault ships. There are many solutions to this problem. One is simply “more ships”. There are however, two other options that immediately spring to mind, namely CVF or LHD. Increasing the size of the airwing on the CVL from 20 aircraft to 30 allows the carrier to be dedicated to Sea Control aviation duties, including ASW. This relieves the burden on the amphibious ships and allows them to concentrate on supporting the landed troops. Increasing the size still further to around the 40 aircraft mark allows us to embark many of the additional aircraft required for assault/support operations and removes the need for any aviation maintenance capability on the assault ships. This makes the assault ships even cheaper as they become simply lillypads for helicopter landing, takeoff, and refuel. We also end up with a carrier that can do some serious damage if needed. The other option is to “bolt” the Sea Control Carrier onto the top of the assault ship to save money on crews and hulls. This yields a ship that can operate as either a Sea Control Carrier or an assault ship. It cannot easily do both at the same time as a flooded well deck and manuevering to launch landing craft would conflict with the need to manuever for winds to launch and recover jets. This means we would need more ships which negates the cost saving advantage. That said, it is worth bearing in mind that four such ships could provide sustained defensive sea control near one’s home waters, or the ability to “surge” two ships forward for an offensive – with one tasked for sea control and the other as a true helicopter-carrying assault ship. The two on station would be sustained by the two back at port. It then becomes a costing exercise to determine which is the most sensible avenue to pursue. Given the original £2b figure per CVF, the choice is obvious. 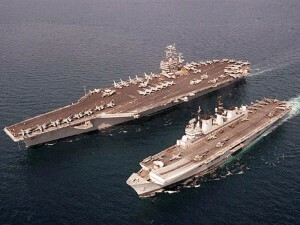 Increase the size of the aircraft carrier. Furthermore, by accepting possible gaps in sustained operations, we can reduce the number of carrier hulls to two. This along with RFA-owned/operated amphibious assault ships is the way I belive the U.K. is headed. The need for a heavy amphibious assault is diminishing. The need for continuous presence and logistical support is increasing. I therefore question the sale in 2011 of the RFA Largs Bay to Australia in favour of keeping our LPDs. “Simon” is a tax-payer (annoyed about: the aircraft carrier debacle, and generally the way the U.K. is run) – okay I’m just a grumpy old man! I have a degree in aerospace engineering and work as a self-employed IT consultant. Unfortunately the bottom fell out of the defence industry when I graduated so I was left high-and-dry with a degree in a discipline considered unimportant by HMG. I’m just biding my time until Britain wants to rebuild her empire with imagination, ingenuity, and a nice hot cuppa. This post appeared in its original form and was cross-posted by permission from Think Defence.